Part of the Tanauan to Lipa Road. Image source: University of Michigan Digital Photograph Library. Colorized courtesy of Algorithmia. In this article, we take a look at public works projects undertaken by the Bureau of Public Works (BPW) of the American colonial government in the Province of Batangas in the year 1915. The information has been taken from quarterly bulletins published by the bureau. The public works projects were really quite basic: roads, schools, markets, water systems, etc. that one immediately sees the difference between the American and Spanish colonial regimes; and one immediately asks why the latter could not have even conceived of these. Some of these projects probably exist even to the present day; although it goes without saying that the Second World War would also have destroyed others. • Nasugbu Central School Building, Plan No. 10, finished. • Ibaan Central School Building, Plan No. 3, finished. • Tuy School Building Plan No. 4, completed at a cost of ₱8,700. • Mataasnakahoy School Building Plan No. 2, completed 24 March 1915. • Lipa, plan No. 2 building at Banaybanay completed at a cost of ₱4,800. • Talisay, authorization had been received to commence construction for a Plan No. 4 building. • Batangas Town, two building blocks of tiendas (a tienda, each 4 x 6 meters, a tienda presumably being a market stall), was completed on 14 May 1915. A 68.7 x 24 meter Plan B type market building at a cost of ₱26,000. • Tanauan, a 30 x 43.5 meter “no–court” type building was completed 22 February 1915 and turned over to the municipal government. • Lemery, type B 21 x 39.8 meter building was constructed at a cost of ₱13,300. • Santo Tomas, Type A 15 x 43 meter building was completed at a cost of approximately ₱11,000. • San Jose, bids were being received for the construction of a Type A 18 x 30 meter market. 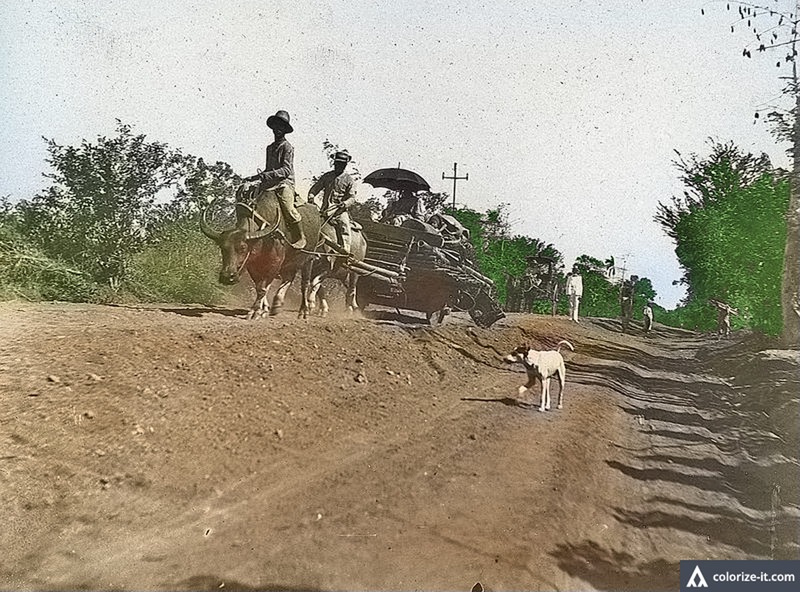 • Tuy-Nasugbu Road, nearing completion in the last quarter of 1915. Three bridges that were part of the project were also under construction, and when the project was completed, it would provide “a continuous first class road from Batangas (Town) to the China Sea, a distance of 74 kilometers. • Batangas-Rosario Road, was progressing very well but the project was interrupted in August by the rainy season. This project was expected to be completed by the end of the year. • Lemery-Calaca Road, about 6 kilometers completed of a standard 7-meter roadbed. Another 8.8 kilometers of this road project was still to be completed. This project was notable for being the cheapest road construction in Batangas at the time. • Late in the year, estimates were being made for the construction of the Lipa-Rosario and Lipa-Luta (in Malvar) roads. • Plans and estimates were being made to connect the Manila-Batangas road to Taal Lake (probably the Tanauan-Talisay road). • Water Pumping Plant, Batangas Town; a small water pumping and storage plant at the grounds of a government building to supply water to nearby government–owned facilities. The plant had a 10,000 gallon capacity tank 60 feet above the ground and water was pumped into it using a steam pump. • Lipa and Cuenca, surveys were undertaken to construct pumping plants similar to that built in Batangas Town. • Five artesian wells successfully drilled, 4 in Batangas Town and one in barrio Bolbok which could yield 20 gallons per minute from a depth of 600 feet. Six more wells were drilled in different barrios of the town in the last quarter of the year. • Taal-Lemery water system, under construction. • Balayan, construction of a water supply system completed, with water flowing from an artesian well at 250 gallons per minute at ground level. • Batangas Town, dikes 3 and 4 built along the Calumpang River to prevent encroachment of the river into the town were partly destroyed by severe flooding in 1914 and were repaired. • Lemery, a two–story concrete standard Scheme A Presidencia (or Town Hall) Building was completed on 6 March 1915 and subsequently occupied by the municipal government. Two band stands were constructed at the plaza of Batangas Town, each costing ₱1,000. • “Quarterly Bulletin, Volume 3 Number 4,” 1 January 1915, published by the Bureau of Public Works. • “Quarterly Bulletin, Volume 4 Number 1,” 1 April 1915, published by the Bureau of Public Works. • “Quarterly Bulletin, Volume 4 Number 2,” 1 July 1915, published by the Bureau of Public Works. • “Quarterly Bulletin, Volume 4 Number 3,” 1 October 1915, published by the Bureau of Public Works.